Having written a lot of copy for a travel company that specialized in Japan, there are a lot of places I know about but have never been. 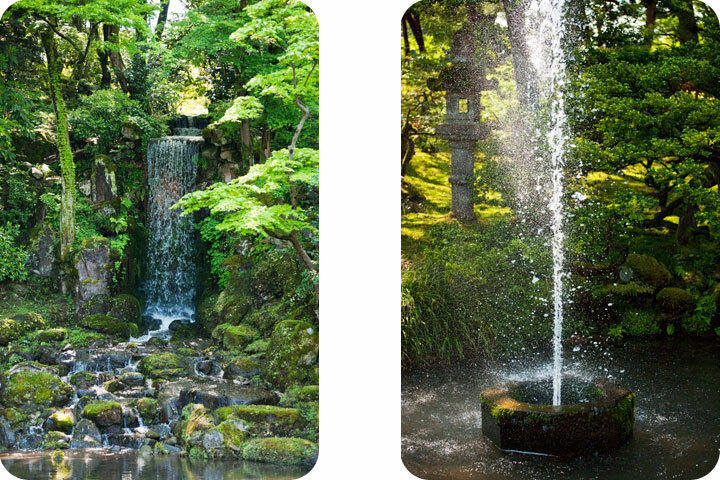 Kenrokuen Garden was one of these. A lot of our recent trip around Japan was about getting to know the country, seeing for the first time places we’d only read about, no matter how in depth. Very little can prepare you for much of this country: it is so rich in history, in landscape, in variety. It takes me a long time to digest experience. We started by going north into the last of the snow, where beech groves, knee-deep in snow, were bursting into light green leef, and then struck out for the sea on Japan’s cloudy coast. Where Noto Peninsula joins the mainland, we came to Kanazawa, a green city with wide straight streets and one of Japan’s most famous gardens, the lush green Kenrokuen. I’d read about it extensively, in travel guides and websites and travel blogs, looked at photographs and read the history, and written about it, about the waterfalls and the fountain, but seeing it in the morning light with everything green and golden was something else entirely.